Gluefast offers adhesives and application equipment for applying glue to labels. 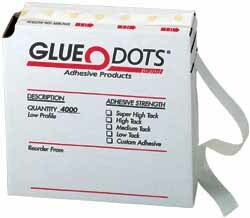 Use Dot'n'Go to apply Glue Dots quickly, cleanly and precisely with a single use disposable handheld dispenser. Available in three levels of tack strengths. Adjutant Rotary Press - A labor saving machine that smooths out the wrinkles on the glued label/board stock combinations. Three sizes available: 20" (Twenty Inch roller), 32" (Thirty Two Inch), and 42" (Forty Two Inch) widths. Used in conjunction with the Colonel. Captain B Electric Gluer - Table top gluer for applying glue to labels. Available in three widths, 8" (8 Inches), 10" (Ten Inches), and 14" (Fourteen Inches). Also available with explosion proof air motor models, and special strip gluer model. Craqulure/Faux Canvas Coating - A coating product used to enhance pictures and posters with a texture finish. Order a kit to try it out. Electric Edge Gluer - Applies adhesive to the edge of stock up to 5/8" thick. Available in 2" and 4" widths. For 5" contact our office with your application. Glue - For a variety of label applications. Hot melt glue sticks also available. Glue Guns - Hand held industrial grade hot melt glue guns available in two models. Glue Pillows - Hot melt glue in bulk for automatic systems. Email your requirements for more info. Glue Spots - Ready to use in place of hot melt glue guns. Glue Sticks - Hot melt glues stick for Gluefast Glue Guns in 8 or 22 pound boxes. Label Pro 5.5E - World's most compact motorized label gluer for labels up to 5 1/2" wide. Impulse system turns the gluer on when required. Available in a manual version as well. Model C and S Moistener - The worlds last surviving moistener for wetting gummed label stock. P.A.T. Systems - Pneumatic Adhesive Tank. Best way to apply adhesives to large items, or uneven materials. A "walk-about" gluer that allows the operator to take the glue to the product. Available in 3, 5, and 10 gallon tanks with either glue heads or atomizing sprayer. Email your requirements for more information. Senator Top Coat Gluer - Applies adhesives and Craqulure/Faux to the top side of materials. Email your requirements for more details. 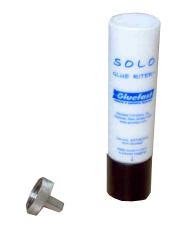 SOLO GLUE RITER - is ready when you are. Forms lines or dots of glue. Email your requirements for more information.